On the peninsula south of Wilmington, about a half-mile north of Snow’s Cut, just northeast of Doctor Point, was a large tract of land on which was located a colonial mansion known as Sedgeley Abbey. The land was probably not used as a rice plantation, although some of the property was in inland swamp. Most of the land, however, seems to have been a sandy plain, thinly covered with pines and scrub oaks. The property located near Gander Hall also touched the Haulover plantation on the sea-side. Sedgeley Abbey was built in the 1700s, possibly by William Lord. 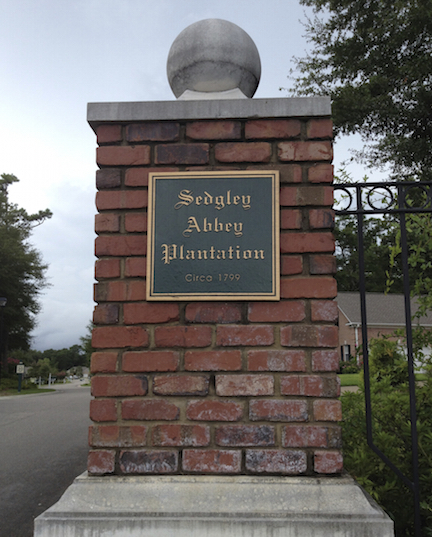 Sedgeley Abbey, constructed from coquina, was described “as one of the grandest colonial residence of the Cape Fear.” Historian James Sprunt compared Sedgeley Abbey in dimensions and appearance to the two-story, cellered Governor Dudley mansion in Wilmington. A corduroy road was also built across the peninsula to a river landing. Sprunt indicates that the plantation house was constructed in 1726 by a Peter Maxwell, but according to his headstone in the St. Philip‘s Church graveyard at Brunswick, Peter Maxwell was born in 1753. In June 1788, Peter Maxwell purchased from William Lord 320 acres lying at the head of Lord’s Creek. Presently Lord’s Creek is known as Telfairs Creek and terminates on the southern end at Snow’s Cut. Both the Joshua Potts map of 1797 and the Price and Strother map of 1808 indicate the “Maxwell” dwelling in that section of the peninsula. To the south and adjacent to Sedgeley Abbey, a John Guerard, sometimes spelled Gerrard or Geuard, purchased in 1776 a 600-acre tract of land from William Dry. In 1778 Guerard purchased another 920 acres from William Dry and also received grants in 1780 totaling an additional 970 acres near the sound. Guerard lived with his wife, Rebecca, on this property until his death in 1789. Sedgeley Abbey is most closely associated with Peter Maxwell. Peter Maxwell maintained cultivated fields, as well as indigo farms, orchards, and even a horse track at Sedgeley Abbey for a number of years, although by 1801 he decided to place the plantation up for rent. To Rent – for a term of years, or may be agreed on. That fruitfiil, healthy and beautiful Plantation, near the head of the Sound, known by the name of Sedgeley Abbey for which there is a very commodious and well-furnished dwelling house, open to the sea beach by an, avenue, and about half a mile from the Sound, which at all Seasons affords abundance of Fish and the best Oysters in the State. There is also on the same a good Kitchen, Smoke-house, Barn, Stable, and Chairhouse, with a remarkable fine Peach Orchard — The land is well adapted to the culture of Corn, Cotton and Indigo, there is adjoining the house about 16 acres of rich inland swamp, which can be easily overflowed, much of which is cleared, and will produce excellent Rice. Whoever may rent the same can be accommodated with most kinds of plantation furniture, and supplied with, any stock belonging to the land at a valuation. For terms apply in Wilmington to Peter Maxwell, (Wilmington Gazette, December 24, 1801). In accordance with the expressed wishes of the late Peter Maxwell, the great estate was sold, by the executor of his will. About 800 acres of land, including Sedgeley Abbey, was sold in 1815 to Sedgwick Springs $950. The larger, 1,380-acre, tract was purchased that same year $295. 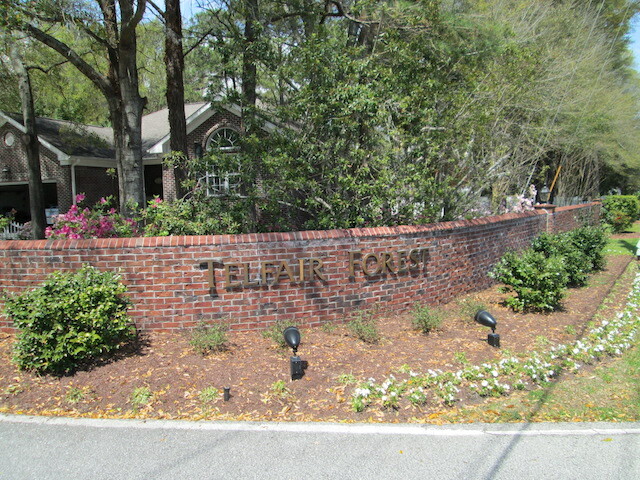 by James Telfair, after whom the creek on the property is named. Sedgeley Abbey plantation was again sold on December 31, 1821 by Sedgwick Springs, for $1750, to Hosea Pickett, who in turn deeded it the following year to Henry B. Howard in exchange for a loan. Upon repayment of the loan, the deed to Howard was voided. Hosea Pickett apparently paid his debt to Henry Howard, as the plantation remained in his possession until alter the Civil War. Sedgeley Abbey plantation was placed up for sale in November 1866, following Pickett’s death. At that time the plantation consisted of “about 3,000 acres, situated upon the Federal Point road. ” There were “about 500 acres of good farming land.” About 275 acres were cleared and fenced, with an ample amount of timbered land. In addition to a five-room dwelling house, the plantation also included a stable, barn, and servants’ quarters. By the 1870s Sedgeley Abbey lay in ruins. By the turn of the century only the cellar remained. The ruins of the plantation house lay obscure for a number of years. In 1978 archaeologist Mark Wilde-Ramsing, now of the Department of Cultural Resources, located the cellar remains of Sedgeley Abbey west of Highway 421. The cellar had been dug into stone approximately 8 feet deep. When revisited again in 1992, the foundation measured 30 feet by, 12 feet, and on the western end sank 6 feet below the normal ground surface. 1975 “Land of the Golden River“. Volume 1. 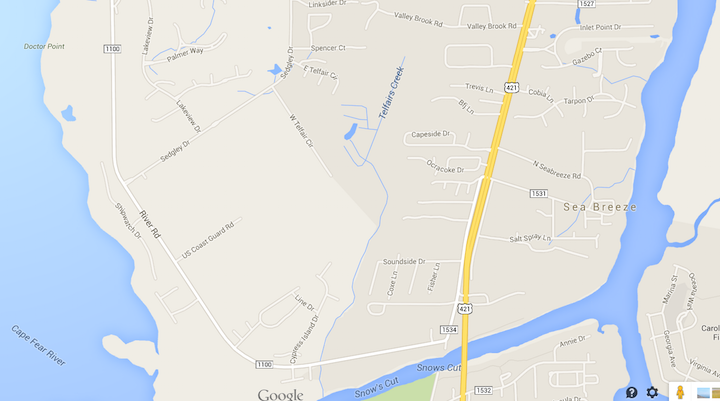 Wilmington, NC: Wilmington Printing Company. 1973 “Early New Hanover County Records“. Wilmington, North Carolina: Published by the author. New Hanover County Deeds and Wills, Wilmington, North Carolina. Price, Jonathon and John Strother. 1807 “A Map of Cape Fear River and its Vicinity from the Frying Pan Shoals to Wilmington by Actual Survey“. Division of Archives and History, Raleigh, North Carolina, Map Collection 131-F.
1896 “Tales and Traditions of the Lower. Cape Fear, 1661-1896“. Wilmington: LeGwin Brothers. Reprinted by The Reprint Co., Spartanburg, South Carolina, 1973. 1989 “A History of New Hanover County and the Lower Cape Fear Region, 1723-1800″. Volume 1, Bowie, Maryland: Heritage Books, Inc.
Wilmington Daily Journal (Wilmington, NC), November 10, 1866. Wilmington Gazette (Wilmington, N.C.), December 24, 1801. Wilmington Morning Star (Wilmington, NC), January 7, 1898.